The main campaign of the Changemaker network is for better global food security. There is enough food for everybody in the world, and yet 800 million people hunger. This is a result of political choices, and can be changed. Food security means that you have enough nutritious food today, and a secure source of food for the foreseeable future. Food security is one of the focus areas of the finnish development cooperation. The political will is strong in speech, but the delivery is lacking globally. The campaign has three demands. The first one is for the foregin ministry to designate a person to work on coherence of the food security policy of the development and forgein aid sectors. The second demand is that Finnfund preforms a food security impact assessment prior to giving a loan. 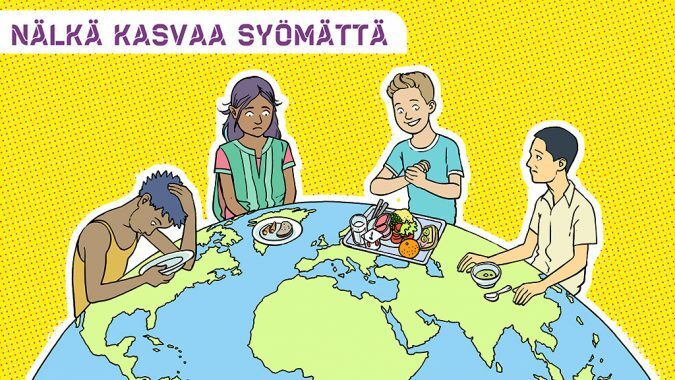 The third demand is for Finland to champion a holistic approach to food security in the United Nations, especially the Food and Agriculture Organisation. You can participate in the campaign in many ways, start by signing the petition HERE. (opens in a new tab) and join the Changemaker environment action group facebook group or the e-mail listserv. Beyond political demands there is a responsebility for the impact our food choices have on the people and the planet. Work towards cutting down on food waste.